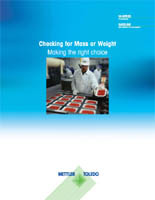 Gravimetric weighing technology is recognized as the only method for checkweighing accurately and reliably with results that can be verified and traced to a certified weight standard. Gravimetric checkweighers, like the HI-SPEED X-series™ are the gold standard ensuring packaging compliance and operational productivity. Thousands of these systems are embedded in production lines around the world ranging from pharmaceutical, to food processing, and even in industrial processes such as metal parts manufacturing. The sole function of a gravimetric checkweigher is to be the best at weighing; the core competency of the X-ray inspection system is contaminant detection and checking for package integrity. While there has been some recent discussion by some x-ray companies regarding the utilization of that technology for checkweighing, the fact is that an x-ray can estimate mass but it cannot weigh.